Batur Volcano is located in north east Bali. Batur is one of the most impressive calderas in the world. It is 13.8 km by 10 km in size. 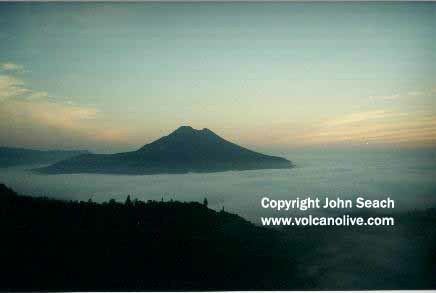 Within the caldera is Batur volcano and a lake. The volcano rises 700 m above the surrounding terrain, and consists of a main cone with three summit craters flanked by a small parasitic cone (Butus) on its SW slope. In September 2012 Batur Global Geopark was declared by UNESCO for its cultural significance and natural scenery. Batur volcanic field is located 300 km north of the Java trench and 150 km above the north-dipping Benioff zone. The crust beneath Bali is about 20-km thick. stratovolcano (Penulisan volcano) in the northwestern sector of the volcanic field. This was followed by formation of an 800-m high basaltic to dacitic parasitic cone (Abang volcano) also formed on the SE flank of the main field. The first caldera was formed 29,300 years ago and was associated with eruption of dacitic ignimbrite (Ubud Ignimbrite). An andesitic to dacitic lava–dome complex (Bunbulan lava–dome complex) and a small tuff cone (Payang tuff cone) formed within the caldera after the first caldera forming event. A second caldera-forming eruption occurred 20,150 year ago and was accompanied by eruption of andesitic to dacitic ignimbrite. Batur is a currently active stratovolcano, which has formed in the smallest and youngest caldera. Historical activity at the volcano includes 25 mild to moderate strombolian eruptions, with lava flows in 1849, 1888, 1904, 1905, 1921, 1926, 1963, 1968 and 1974. Hiking trail was closed at Batur volcano in Bali, Indonesia due to fears of an eruption. Between 1-11 November 2009 there were 53 deep and 83 shallow volcanic earthquakes. Batur volcano is a popular tourist location on Bali, and offers spectacular views of one of the world's most impressive calderas. The last eruption of Batur volcano was in 2000 when ash emissions reach a height of 300 m above the summit. Volcanic earthquakes increased significantly at Batur volcano in Indonesia on 8th November 2009. Shallow volcanic earthquakes measured at the volcano were: 11 in September, 20 in October, 7 between 1-7 November, and 53 on 8th November. The alert status at Batur volcano was increased on 8th November 2009 from I (Normal) to II (Waspada). Eruptions at Batur volcano began in March 1999. Six explosions occurred on 17th May 1999. An explosion on 25th May 1999 produced incandescent ejections which fell around the crater. Am explosion on 22-23 March 2000 ejected material 200 m above the crater. Ash emissions continued until April 2000. In July 1998, ash emissions were observed rising 300 m above the crater. An eruption occurred on 7th August 1994 with ash falling at Kintamani on the caldera rim, and incandescent lava ejected to a height of 300 m.
1999-2000, 1998, 1994, 1976?, 1974, 1973, 1972, 1971, 1970, 1968, 1966, 1965, 1963-64, 1926, 1925, 1924, 1923, 1922, 1921, 1905, 1904, 1897, 1888, 1854, 1849, 1821, 1804.